There's a saying that a watched pot never boils. You could also say that a watched plant never grows—unless it's being watched by a laser-wielding, 3D plastic sculpture-printing, growth-tracking megarobot. 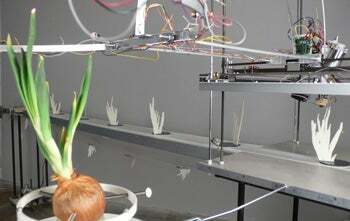 David Bowen's "Growth Modeling Device" uses a circular rig to scan an onion once a day with a laser, then employing a "fuse deposition modeler" to generate a plastic sculpture of that scan. When the model is done, a conveyor belt burps into action, moving the recreated onion out of the way and making room for the next day's piece. What you end up with is a visual record of the onion's growth over the course of a few weeks—with no tears involved!